Home › Health Sciences Library › Health Sciences Librarian, Gregg Stevens, wins best research presentation! 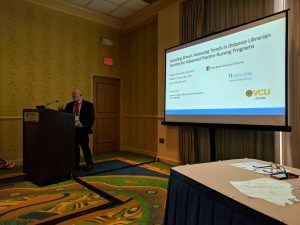 Gregg Stevens of the Health Sciences Library recently attended the South Chapter meeting for the Medical Library Association and presented his research project; Speeding Ahead: Assessing Trends in Distance Librarian Services for Advanced Practice Nursing Programs. This research was co-authored by Elizabeth G. Hinton of University of Mississippi Medical Center & Roy E. Brown of Virginia Commonwealth University. Gregg and his research team won first prize in the category of presented research papers. Congratulations to Gregg, Elizabeth and, Roy on their outstanding work and achievement! Jamie is the Head of the Health Sciences Library. She is the liaison to Medical Humanities, Social Welfare, and Dental Medicine.